The development of the liquid biofuels sector has been dynamic for more than 10 years, but from the very beginning of this process has been accompanied by a number of controversies as the production and use of liquid biofuels have both positive and negative effects. These consequences primary concern socio-economic and environmental areas. The most important economic benefits are connected with production, turnover and employment in the biofuels industry and the development of agriculture through higher demand on agricultural commodities. The aim of the paper was to quantify labour productivity in the liquid biofuels sector in European Union countries. 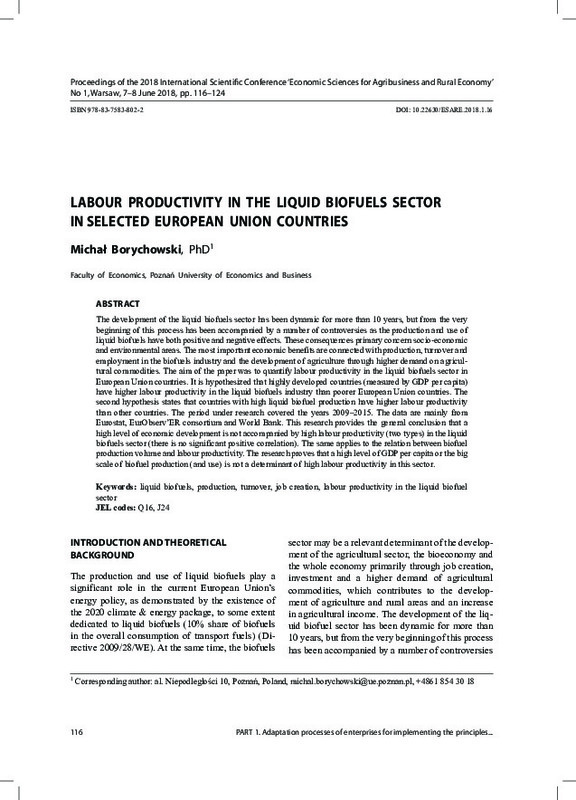 It is hypothesized that highly developed countries (measured by GDP per capita) have higher labour productivity in the liquid biofuels industry than poorer European Union countries. The second hypothesis states that countries with high liquid biofuel production have higher labour productivity than other countries. The period under research covered the years 2009–2015. The data are mainly from Eurostat, EurObserv’ER consortium and World Bank. This research provides the general conclusion that a high level of economic development is not accompanied by high labour productivity (two types) in the liquid biofuels sector (there is no significant positive correlation). The same applies to the relation between biofuel production volume and labour productivity. The research proves that a high level of GDP per capita or the big scale of biofuel production (and use) is not a determinant of high labour productivity in this sector.